Policemen stand guard at the police headquarters in Jos, Nigeria, on March 10, three days after the massacre. 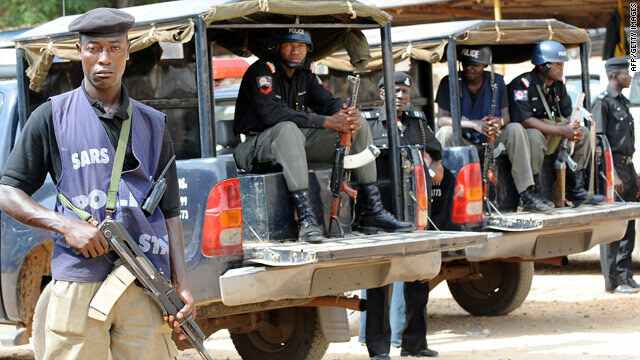 Lagos, Nigeria (CNN) -- More than 160 people have been arrested in connection with the massacre earlier this month of scores of people in central Nigeria, a national police spokesman told CNN Monday. Of the 163 arrested, 41 will be charged with homicide, said spokesman Emmanuel Ojukwu. The other 122 will be charged with rioting, arson and possession of firearms, he said. More than 200 people died in the March 7 massacre, according to some estimates. They took place in predominately Christian towns near the city of Jos, where about 150 people, mostly Muslims, were reported killed in January. The region lies on a faith-based fault line between Muslim-dominated northern Nigeria and the mainly Christian south. Ojukwu said the ethnic backgrounds of those arrested are mixed, but they are all from the area near Jos. Human Rights Watch said the attacks by Muslims with guns, machetes and knives apparently were in retaliation for the previous attacks against Islamic communities and the theft of cattle from herdsmen. Last week, at least 11 more people were killed in a predominantly Christian village. Choji Gyang, special adviser on religious affairs to the governor of the Nigerian state of Plateau, has said the attackers were Muslim herdsmen, some dressed in military uniforms. They also stole about 120 cattle from the village, he said. The violence has put much of oil-rich Nigeria, Africa's most populous nation, on edge. Authorities in Lagos took the unusual step of sending a text message to residents earlier this month to try to put them at ease. The violence often pits Christians and Muslims against each other. But John Onaiyekan, Roman Catholic archbishop of Abuja, Nigeria, and former Nigerian President Olusegun Obasanjo have said that the violence is fueled more by other factors: ethnic, social and economic problems. "If you have one group or a community that has land that's been encroached upon by another community or even by itinerant cattle farmers, then the people who lay claim to the land will fight back," Obasanjo recently told CNN. "If there are job opportunities in an area, and persons believe they are indigenous to that area, and (are) not getting enough out of the jobs that are available, they will fight those who are getting the jobs."